Since B was born, we’ve admittedly done a lot of cruises, something we wouldn’t have thought about doing pre-baby. For folks who have never been on a cruise, there are some common preconceived ideas about what they are about. Though we’ve been on many cruises, we’ve never attended an art auction, gone gambling in the casino, jockeyed for a lounge chair next to the pool, learned how to make a folded towel animal, entered a belly flop contest or gone late-night dancing. We don’t pay extra to eat at specialty restaurants, buy duty-free items or spend money in the shops. We rarely even take advantage of the kid’s centers. Frankly, we are usually just too busy. I’m not a fan of crowds so we generally steer clear of the crammed swimming pools, the loud music and the sizzling sunbathers during the busiest daytime hours. But before 10 am, and after 5 pm, we usually have the pools, basketball court, shuffleboard, mini-golf and other outdoor venues all to ourselves - and get to enjoy them when the sun’s rays are less intense. These outdoor activities are usually open 24 hours and since B is an early riser, by the time most folks roll out of bed, we’ve already had hours of family fun. 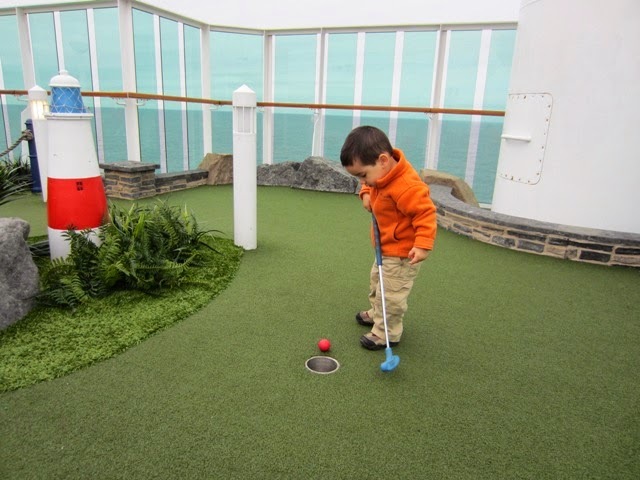 Some of our favorite after-dinner activities are to play a few rounds of mini golf or have a swim in the moonlight - something we rarely, if ever, have the opportunity to do at home. We live in Toronto, and light pollution often foils our attempts at star-gazing. Sure, we could drive out of town, but by the time the sun sets in summer, B is asleep - and in winter when the sun sets earlier, it’s not much fun to sit outside in the cold for long. Cruising in the Caribbean and other places where the sun sets earlier, and where the skies are dark and clear, allows us to grab a cool drink, relax on a lounge chair and watch the stars - and still get to bed on time. The Night Sky app on my tablet makes this activity extra fun! If we are spending a day at sea, we skip the crowds by taking in a movie or planting ourselves at a quiet table to read books about our destinations, play cards, build Lego creations or do crafts. We never travel anywhere without a small container of Lego and a bag stuffed with craft supplies like beads, pipe cleaners, pencil crayons, a glue stick, small sheets of paper, coloring pages and stickers. By the end of the cruise, our cabin looks like an art gallery! Most cruise ships have lots of quiet, common area spaces to enjoy some relaxing family time if you don’t feel like hanging around in your cabin. Most cruises have formal nights. We don’t get too dressy… In these days of all the luggage surcharges, who has room to pack a ball gown? But we do dress smartly and the photographers and backdrops set up around ship allow us to easily and inexpensively get a new family portrait or playful shot of B - without having to pay a sitting fee or stick to a pre-arranged appointment, when B will inevitably be in a bad mood. Have you ever taken your child to see a live show, then had to leave early because he or she was fussy and/or uninterested? Many cruise lines offer everything from full production shows, live music, magicians, ice shows, aerial acrobatics to movie screenings by the pool. But since they are included in the cruise fare, you can come and go as you wish (obviously as long as you aren’t disturbing others) when the little ones get fidgety or need to use the washroom. On a recent cruise, B found the showing of Disney's Frozen a bit too scary, so we just left and went and did something else. No parking hassles, no pricey tickets gone to waste and no arm-and-a-leg investment for snacks. This same cruise also had a spectacular 15-minute aerial acrobatic show in the centrum area based on the Jack and the Beanstalk tale, which was just the right length of time to catch just before dinner. How do YOU spend your time cruising? I really love your blog and with our first child on the way it's given me the encouragement to continue travelling, obviously with a few adjustments. Think we're going to plan a Mediterranean cruise for next September when little one will be 14months. Will be heeding all your tips. Thank you. Kath. UK. Kath, thank you so much for your message! Congratulations and best of luck with the new addition! Travel can feel a bit daunting with all the baby gear and details but it is so worth! Have a wonderful time traveling with your little one!